The Christian Science Monitor series People Making a Difference (“ordinary people taking action for extraordinary change”) has so many great leads, I have to restrain myself from using one every day. The Monitor staff don’t write all the stories but, like me, harvest from hither and yon. This story, about “sack farming,” is from the Thomson Reuters Foundation, which I wouldn’t have known about either but for the Monitor. Caroline Wambui writes, “Central Kenya’s Nturukuma region is not kind to farmers – its erratic rainfall, desert vegetation, and drying riverbeds push most people into making a living through trade rather than agriculture. “Jane Kairuthi Kathurima toiled for years as an animal herder in the semi-arid conditions of Laikipia County, but struggled to feed her family – until she discovered sack farming, which has transformed her life and those of her children. “Sack farming involves filling a series of bags with soil, manure, and pebbles for drainage, and growing plants on the top and in holes in the sides. The sacks allow people to grow food in places with limited access to arable land and water. 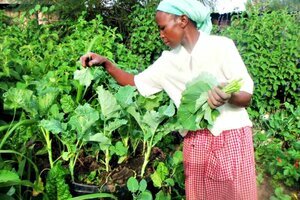 “Two years after setting up her sack farm, Kathurima now grows enough vegetables – including spinach, lettuce, beets, and arugula – to feed her family and sell the surplus to the community. … Now she is supporting other food-insecure farmers by encouraging them to think differently. “The group behind sack farming in Kenya is GROOTS (Grassroots Organizations Operating Together in Sisterhood), a global network of women-led groups which help women solve problems in their communities by changing the way they do things. Jane Kairuthi Kathurima cuts kale at her sack farm in central Kenya. She grows enough vegetables to feed her family, selling the surplus to the community.